Using AI on the edge to classify recycle vs. landfill and use robotic arm for sorting the garbage. Robotic Arm has already been changing the evolution of human being. But the knowledge is usually kept as industrial level, while building this project, it was still difficult to find open source guides and libraries that both utilizes and controls the robotic arm, so I've decide to write a guide on how to use the robotic arm using Raspberry Pi 3 to sort out recyclable garbage. If we want robotic arm to move on it's own we'd need AI on the edge. In this specific example we are going to use detection method since the arm shouldn't do anything when nothing is detected. According to Google Research Publication, Single Shot MultiBox Detector (SSD) discretizes the output space of bounding boxes into a set of default boxes over different aspect ratios and scales per feature map location. At prediction time, the network generates scores for the presence of each object category in each default box and produces adjustments to the box to better match the object shape. network also combines predictions from multiple feature maps with different resolutions to naturally handle objects of various sizes. For the past couple of years we've been using YOLO, but with advancement of SSD it is much faster than the YOLO method. Also, SSD is a lot more efficient than traditional YOLO method as SSD uses multiple activation maps for the bounding box as YOLO uses a single activation map for prediction of classes and bounding boxes. We utilized couple of libraries such as qt 5 where you have to install prior making the project work. And after not finding much support on dobot's website, we've still managed to get Dobot Arm working with Raspberry Pi3. 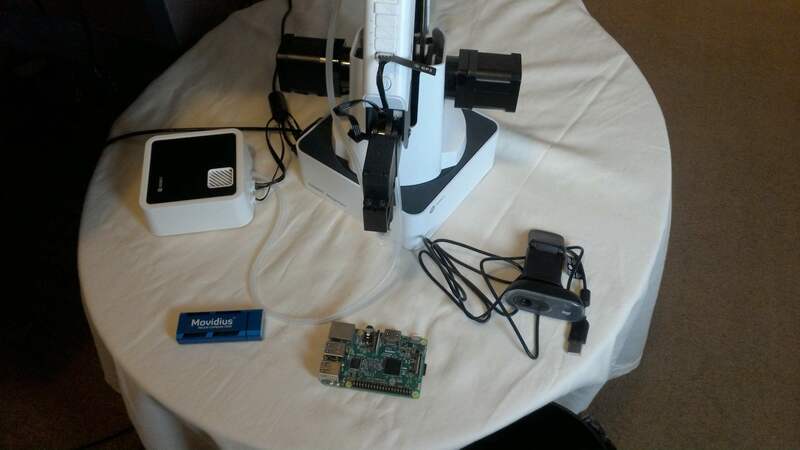 The equipment needed is a Raspberry P i3 B+, Movidius NCS, robotic arm and Suction Cup Addon. Make sure you have a 5v/2.5 amp power supply, between camera, Neural Computing Stick and Pi itself we'd need a little more power. Personally I've tried 2.1amp and it was not enough. With a clean SD card, we'd first need to download Raspberry Pi to the mini SD card so we can use Pi as our operating system. Alternatively, the Ubuntu Mate would also work for this project. After that, we should be able to see the basic control over the Dobot Arm using Raspberry Pi. Afterwards, we'd need either PC or Mac to program each state of the arm when triggered. In this case we will do just 7 steps, we can do this automatically by holding the lock button on Dobot Magician Arm and change the value of suction cup. Next we can program the raspberry pi's python file to do the same which can create the similar movement. We need to repeat the process and create the second batch that is "recyclable.json"
Next we need to download all the sample apps ncappzoo, which is also created by Movidius, and the specific app we need is stream inference, which can be gotten from the example file. From here, let's use the 2 different objects, that one is garbage and another is recycle for our demo. We can use the other classifications as recyclable goods. From Step 2, when all said and done. 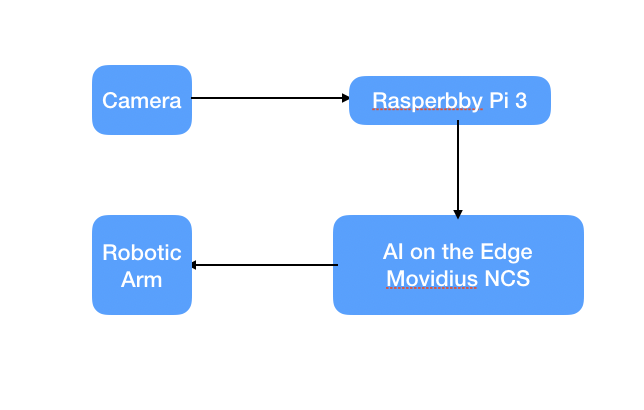 We can use following code to run the AI on the edge through Movidius NCS and trigger the robotic arm movement. #print( "I found these objects in "
# frame can be displayed. Close the window if 'q' or 'Q' is pressed. Everything is said and done, enjoy the robotic arm that's powered by AI. Now that you've learned how to build robots through AI, use your power for good.